Unmanned tractors sow seeds pretty fast on an expansive cotton farm belonging to the Xinjiang Production and Construction Corps, in Northwest China, where drones fly at a constant height of 1.8 meters above wheat plants and spray fertilizer on the growing crops. These marvels mark China's latest development in precision agriculture, which relies on autonomous vehicle technology supported by the country's home-grown BeiDou Navigation Satellite System (BDS). Accurate positioning based on BDS is essential for precision agriculture, said Zhang Ruifeng, head of the publicity department at the UniStrong Science and Technology Co, which is based in Beijing and offers satellite navigation and positioning services. The firm successfully developed the "Huinong," or "Smart Agriculture" precision system, China's first self-developed autonomous farming machinery, in 2016, with a maximum error margin of 2.5 centimeters in straight line operations. The Huinong system has widely spread in China's major grain-producing areas including Northwest China's Xinjiang Uyghur Autonomous Region and Northeast China's Heilongjiang Province. The performance of the smart farming system has reached a globally competitive level, it can elevate agricultural productivity by 6 percent and the cost of such applications has been reduced by 30 percent as the technology is maturing in China, said Zhang. In the next two to three years, BeiDou's applications in the agriculture sector are expected to play a bigger role, he said. And, the firm is discussing cooperation terms with Russian and Kazakhstani firms on BDS-supported autonomous farming vehicles, Nan Shunxian, the General Manager of the strategic cooperation department of the firm told the Global Times Monday. Besides the agriculture sector, BDS is being widely used in wearable devices, mobile healthcare, express deliveries, bike-sharing services, disaster prevention and relief, and other fields, according to an industry whitepaper released by the Global Navigation Satellite System and Location-based Services Association of China in May. The growth of bike-sharing businesses in Chinese cities has boosted the use of BeiDou in the transportation sector, and is expected to create a 17 billion yuan ($2.5 billion) market by 2020. Mobike, a major bike-sharing company, uses smart locks that support both GPS and BeiDou. One of its rivals, Ofo, said in April that it will soon use BeiDou-enabled electronic locking system. The gross value of China's satellite navigation and positioning industry reached 211.8 billion yuan in 2016, up 22.1 percent year on year, according to an industry whitepaper. Beidou's satellite precision positioning service has also been used by the Beijing Gas Group to detect and locate any gas leaks in its massive pipelines. Sun Jiadong, an academician of the Chinese Academy of Sciences, said BeiDou has a wide range of applications and its satellite positioning service should be developed practically. The BDS will also go out and cover countries and regions along the "One Belt and One Road" initiative route, providing basic positioning services for the route, and at the same time, a global satellite navigation system based on BDS will come into being by 2020, Ran Chengqi, an official at Beidou Navigation Satellite System, told the Smart BDS Precise Application Summit on Monday. The summit also announced the establishment of a 40-member Belt and Road international satellite application cooperation alliance in an attempt to promote the services of BeiDou satellites, the Xinhua News Agency reported. The members of the alliance were not revealed. In the second half of 2017, China will launch six to eight more BeiDou-3 satellites, accelerating its efforts toward the goal of providing navigation and positioning services to the countries and regions participating in the Belt and Road initiative in 2018 and beyond. To date, China has already launched 22 BeiDou satellites into orbit, said Xinhua. By 2020, a flotilla of more than 32 BeiDou satellites in space will form a complete global satellite navigation system. 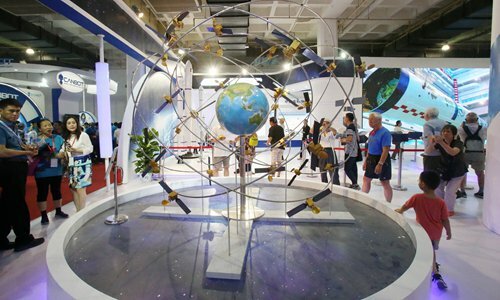 "By then, China's BDS, truly surpassing the Russian's Global Navigation Satellite System GLONASS, and Europe's Galileo, will become a competitive alternative to the US's GPS," Song Zhongping, a Beijing-based commentator, told the Global Times.